Adult Orthodontics Give You a Beautiful Smile at any Age! Braces and invisible aligners don’t have to be just for kids and teens. In fact, the orthodontics team at HGS Ortho in Port Coquitlam and Richmond have helped numerous adult orthodontic patients achieve a wonderful healthy and straight smile with the use of orthodontics. Wondering if you’re too old for orthodontic treatment? You’re not too old for orthodontic treatment! As long as your bones and gum tissue surrounding your teeth are healthy, you’re a candidate for adult orthodontics. 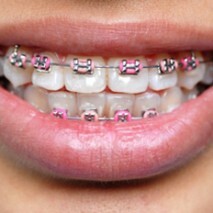 In fact, 1 in 5 orthodontic patients at HGS Ortho in Port Coquitlam and Richmond is over the age of 21. That’s 20% of all orthodontic patients. Worried about your social life and appearance while you undergo orthodontic treatment? Don’t be worried about the effect orthodontic treatment will have on your social life and appearance! HGS Ortho in Port Coquitlam and Richmond offers you a range of treatments that are discreet or invisible for a comfortable, efficient and socially-friendly way to straighten your smile. We offer you Invisalign Invisible Aligners and clear braces for a stunning smile, during and after your orthodontic treatment! Invest in your Smile and your Oral Health. Crooked teeth are harder to clean and keep healthy, which means they’re prone to cavities, plaque buildup, gum disease and tooth loss. A healthy, straight smile is an investment in yourself. Take the first step towards a straight smile and contact HGS Ortho in Port Coquitlam and Richmond today to begin your orthodontic treatment.